Easy off on from I 75. Very friendly staff evening and morning. Zach was very Helpful. Breakfast was good. Price was fair. Where to find Chattanooga hotels near an airport? 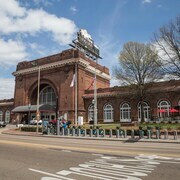 How can I find hotels in different Chattanooga neighborhoods? Where can I find hotels in Chattanooga that are near tourist attractions? Visitors are spoiled for choice when it comes to finding quality hotels and apartments in Chattanooga. If you are after a great place to stay within 0.1 kilometres (0.06 miles) of downtown Chattanooga, Expedia's up-to-date database lists at least 42 hotel options within that area. 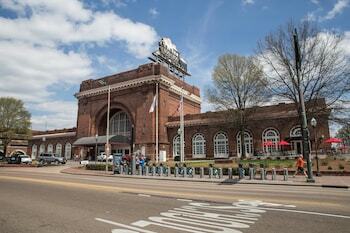 Booking a place close to the heart of Chattanooga is only a mouse click or two away. Expedia's comprehensive database features the Hampton Inn & Suites Chattanooga/Downtown and Residence Inn by Marriott Chattanooga Downtown, which can be found a short distance of Chattanooga's center. 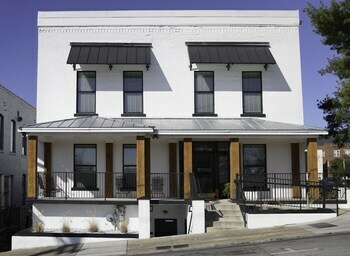 With 14 Expedia hotels, Tiftonia is a hotel neighborhood that is a good place to base yourself. It is 6 kilometres (4 miles) from downtown Chattanooga. Some of the best of the 14 hotel establishments in this neighborhood are the Hampton Inn Chattanooga W Lookout Mtn and Fairfield Inn & Suites by Marriott Chattanooga. You could also find a hotel establishment in Cleveland, which is the neighborhood where you'll find the Hampton Inn Cleveland and Fairfield Inn & Suites by Marriott Cleveland, and Kimball, home to the Holiday Inn Express And Suites Kimball and Hampton Inn Kimball. Hixson is 16 kilometres (10 miles) from Chattanooga's downtown, while Ooltewah is 25 kilometres (15 miles) from the center of Chattanooga. 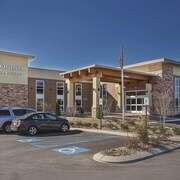 The Holiday Inn Express Hotel & Suites Chattanooga-Hixson and Quality Inn Hixson are situated in Hixson, while Hampton Inn Chattanooga - North/Ooltewah and Holiday Inn Express Hotel Ooltewah Springs-Chattanooga are in Ooltewah. Budget-concious travelers can breathe easy. Chattanooga provides loads of low-cost establishments. 14 kilometres (9 miles) away from Chattanooga's center is where you'll find the Hampton Inn Chattanooga - Airport / I-75. 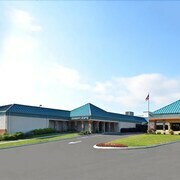 The Fairfield Inn & Suites by Marriott Chattanooga East is only 14 kilometres (9 miles) away. The Clarion Inn Chattanooga W I24 and the Howard Johnson Chattanooga Lookout Mountain are some other lower priced accommodations that are worth checking out. You could investigate the Hilton Garden Inn Chattanooga Downtown and also the DoubleTree by Hilton Chattanooga. 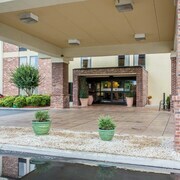 The Hilton Garden Inn Chattanooga Downtown is located 0.9 kilometres (0.5 miles) from the middle of Chattanooga. 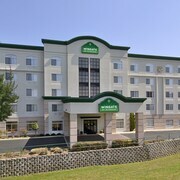 The DoubleTree by Hilton Chattanooga, is positioned 0.7 kilometres (0.4 miles) away. 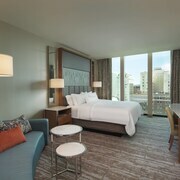 Alternatively, make a booking at the Courtyard by Marriott Chattanooga Downtown or the The Dwell Hotel. The broader Eastern Tennessee region is certainly well worth exploring also. Explore Eastern Tennessee's historic mansions and history museums. You can also take the time to check out the region's mountains and rolling hills. In this section of United States of America tourists may also try their hand at mountain biking. Downtown Chattanooga is 0.5 kilometres (0.3 miles) to the southwest of Chattanooga and is home to the Siskin Museum of Religious Artifacts and Tivoli Theatre. The The Chattanoogan and Staybridge Suites Chattanooga Downtown - Convention Center are some of the long and short-stay options in Downtown Chattanooga. 40 kilometres (26 miles) to the east of Chattanooga, you'll find Cleveland, home to the Wingate by Wyndham Cleveland and Comfort Inn & Suites Cleveland. If you're staying in Cleveland, set aside a little time to check out the Lee University and Cleveland State Community College. Chattanooga Metropolitan Airport is located 10 kilometres (6 miles) from Chattanooga. If you wish to stay close by, can easily book a room via Expedia at the Residence Inn Marriott Hamilton or the Homewood Suites by Hilton Chattanooga - Hamilton Place. What are the most popular Chattanooga hotels? Are there hotels in other cities near Chattanooga? What other types of accommodations are available in Chattanooga? Explore Chattanooga with Expedia.ca’s Travel Guides to find the best flights, cars, holiday packages and more!